Creature Comforts Mobile Veterinary Clinic is now offering animal hospice and palliative care services for pets with life limiting or incurable diseases and their families. Animal Hospice and palliative care provide comfort to companion animals as they approach the end of life. 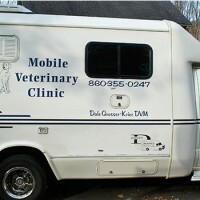 Services may include hospice treatment, pain/anxiety management, holistic healing (referrals) and in-home euthanasia. The concept initially gained significant traction within the pet industry and veterinary medical field. Now pet owners are embracing it. Many pet parents choose hospice care in order to participate in decision making about their pet’s needs, have the time to say goodbye to their companions and plan their deaths. People all over the world are interested in how they can provide meaningful end- of- life care to their pets. I am happy to be at the forefront of this innovative, yet much needed practice. For additional information and a list of frequently asked questions about animal hospice and palliative care, visit the International Association for Animal Hospice and Palliative Care (IAAHPC)’s website. My mission is to educate pet owners with respect to all of the available options. This way we can jointly make the appropriate end-of-life decisions in the best interest of the pet. Additionally I aim to provide a peaceful, stress-free, pain-free respectful passing in the comfort of an animals’ home.